Picture-postcard Bridgefield Guest House is the landmark of the original Margaret River, offering an unique accommodation experience in the town which is at the heart of the Margaret River Region. 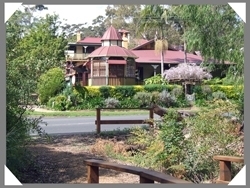 Near River walk trails and opposite Margaret River's Rain Garden, Bridgefield has the best of both worlds by being close to nature yet within a few steps of all the restaurants, shops and other attractions the town has to offer. World renowned beaches, forests, caves, wineries and galleries all radiate in a short country drive from here. The timeless appeal of Bridgefield's heritage accommodations is seamlessly combined by tasteful renovations with modern comforts and conveniences. Continuing this theme there is a shared TV in the guest lounge. All have private bathroom facilities, Free WIFI, reverse-cycle air-conditioning, and separate tea- and coffee-making facilities for those moments of contemplation. 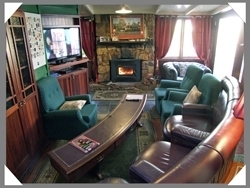 The lounge offers the old time Guesthouse tradition to meet and share travellers' tales with other guests, perhaps over a classy Margaret River red in the cosy warmth of a Winter log fire - and with the parliamentary privilege of doing so from an original circa 1904 backbench from the upper house of the Western Australian parliament. Bridgefield's hosting style is not to intrude into your holiday, rather to help you make the most of your holiday when you need some advice. Choose to make every aspect of your sojourn in Margaret River an experience to remember. Bridgefield looks forward to welcoming you to our Region of particularly unique character and charm, with equally unique character and charm. Park at Bridgefield, and come to Reception just opposite at Adamsons (71 Bussell Hwy) to check in. The Champagne Room is a beautifully appointed, upstairs Queen room in Bridgefield's Gallery with wood panelling, polished local hardwood floors, spa bath and ensuite shower. With views of the forest from the charming verandah, this room is for those who appreciate the finer things. Free WIFI and parking. No check in or check outs on Christmas day. Park at Bridgefield, and come to Reception just opposite at Adamsons (71 Bussell Hwy) to check in. The Champagne Room is a beautifully appointed, upstairs Queen room in Bridgefield's Gallery, with wood panelling, polished local hardwood floors, spa bath and ensuite shower. 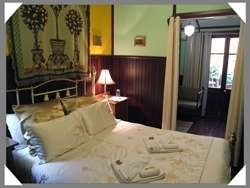 With views of the forest from the charming verandah, this room is for those who appreciate the finer things. Free WIFI , free parking. No check in or check outs on Christmas day. Park at Bridgefield, and come to Reception just opposite at Adamsons (71 Bussell Hwy) to check in. The Champagne Room is a beautifully appointed, upstairs Queen room in Bridgefield's Gallery, with wood panelling, polished local hardwood floors, spa bath and ensuite shower. With views of the forest from the charming verandah, this room is for those who appreciate the finer things. Free WIFI, free parking. No check in or check outs on Christmas day. Park at Bridgefield, and come to Reception just opposite at Adamsons (71 Bussell Hwy) to Check In. Recently renovated, this Queen room with brass bed, and separate ensuite, also features an intimate, private, undercover garden courtyard with outdoor setting for two, with tea- and coffee-making facilities and bar refrigerator. All the charms of yesteryear are warmly felt, with the modern conveniences of reverse-cycle air-conditioning and dual-control electric blanket. WIFI available, free parking. No check in or check outs on Christmas day. Park at Bridgefield, and come to Reception just opposite at Adamsons (71 Bussell Hwy) to Check In. Recently renovated, this Queen room with brass bed, and separate ensuite, also features an intimate, private, undercover garden courtyard with outdoor setting for two, with tea- and coffee-making facilities and bar refrigerator. All the charms of yesteryear are warmly felt, with the modern conveniences of reverse-cycle air-conditioning and dual-control electric blanket. Free WIFI and parking. No check in or check outs on Christmas day. Park at Bridgefield, and come to Reception just opposite at Adamsons ( 71 Bussell Hwy) to Check In. 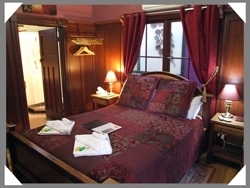 Recently renovated, this Queen room with brass bed, and separate ensuite, also features an intimate, private, undercover garden courtyard with outdoor setting for two, with tea- and coffee-making facilities and bar refrigerator. All the charms of yesteryear are warmly felt, with the modern conveniences of reverse-cycle air-conditioning and dual-control electric blanket. Free WIFI and parking. No check in or check outs on Christmas day. Park at Bridgefield, and come to Reception just opposite at Adamsons (71 Bussell Hwy) to check in. 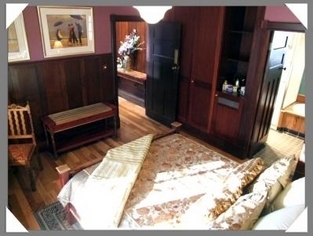 Evocative of yesteryear, the Queen Room with Ensuite has a dado-lined Queen bedroom, with separate bathroom with slipper bath and separate shower, and toilet. Conveniences of today, of reverse-cycle air-conditioning and dual-control electric blanket will ensure your comfort. Free WIFI and parking. No check in or checkouts on Christmas day. Park at Bridgefield, and come to reception just opposite at Adamsons (71 Bussell Hwy) to check in. 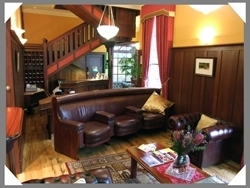 The Merlot Room is a richly wood panelled Queen room in Bridgefield's Gallery next to the reception. 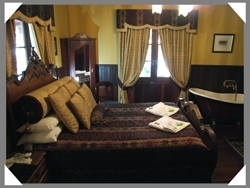 With ensuite shower, reverse-cycle air-conditioning, TV-DVD, and an intimate courtyard complete with pot belly stove. The Merlot is great for the romantics at heart. WIFI available, free parking. No check in or check outs on Christmas day. Park at Bridgefield, and come to Reception just opposite at Adamsons (71 Bussell Hwy) to check in. The Merlot Room is a richly wood panelled Queen room in Bridgefield's Gallery next to the reception. 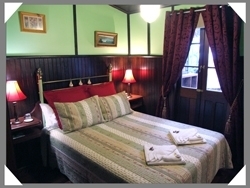 With ensuite shower, reverse-cycle air-conditioning, TV-DVD, and an intimate courtyard complete with pot belly stove. The Merlot is great for the romantics at heart. WIFI available, free parking. .No check in or check outs on Christmas day. Wireless internet is available and is provided free of charge. Bridgefield Guest House accommodation is principally designed for couples, with all but one of the eight accommodations' sleeping being a queen bed. 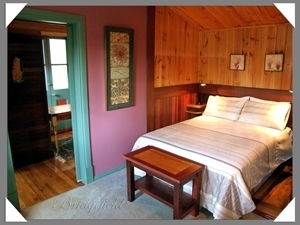 Bridgefield's quaint, free-standing Cabin, however, is able to accommodate a third person. Bridgefield's on-site parking is provided free of charge. Within a short stroll of Bridgefield are the lures of the town of Margaret River, which is in the heart of the Margarer River Region, a place ranked in the top ten of world destinations by Lonely Planet - for good reason. Magnificent coastline with beautiful beaches for swimming, snorkelling or surfing, or just walking along to bathe in a gorgeous sunset, is a short country drive away from town, as are world class wineries, unique forests with unique flora and fauna, galleries and artisans, and a host of providores.